What’s a pin? How do I find a board? How do I …? I love Pinterest and everyone should love it. It’s a mood board. An online mood board, where I can make wish lists for my mum and The Canadian to look through, a place where I can put crafts I want to do and code I want to learn. all. in. one. place. So, I put together a little bit of an introductory guide to Pinterest, in true Pinterest style. So, look over it and see the typed out information at the bottom! My technical skills failed me when trying to upload the above image, Blogger and Photobucket kept resizing the image regardless of what size I uploaded. However, you can find the image in it’s entirety here. A pin is an image that directly links to the source. You can ‘pin’ images to your boards from other people’s boards and, once you get more advanced, you can ‘pin’ images from the internet onto your boards. How does this Pinterest stuff even work? So, you know what a pin is, right? When you pin something you have to immediately categorise it because Pinterest likes neat and tidy. 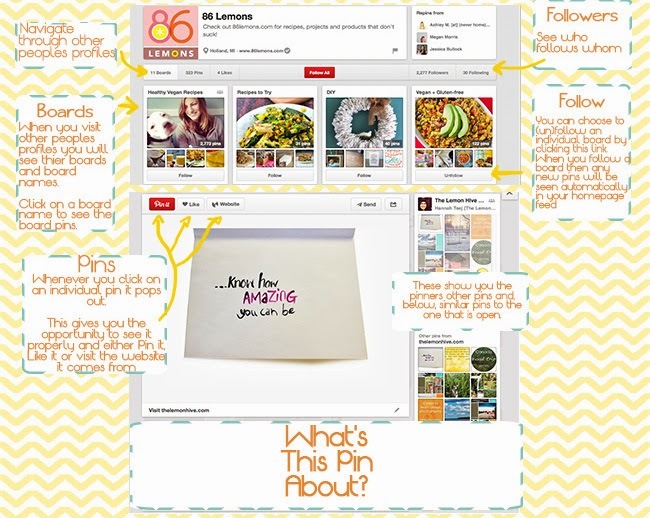 When you first pin an image, Pinterest will prompt you to create a board for it. Pins go into boards. All boards can be viewed under your profile name, and you can view everyone else’s boards. The idea is that you can then review topics and content of interest for you at the right time, there’s no point pinning your living room ideas with your weekend baking plans. Pinterest does allow you to create secret boards, but don’t worry about this yet, it’s way advanced! But, how do I pin things and how do I create boards? This image shows you an example of boards (at the top) and below that an image of a blown up pin. To find an image you like, search for them and explore peoples’ profiles. Once you find a board of interest (see below) you can click on it, it will bring up all the pins on that board, look through them, find a pin that you like and click on it. A box will pop up asking you which board it needs to go into. If you scroll to the bottom of the drop down menu, you will also have the option of creating a new pin. Once you’ve labelled it appropriately, press “Pin It” and you’re done! Congrats, you’ve pinned your first pin. How do I find your boards (someone’s boards specifically)? You can find other peoples’ boards by searching for them. At the top of the pinterest page, you will see an option to search. You can type names, phrases and board names. Anything goes in that box. As soon as you start typing, Pinterest suggests people based on who you are already following, if the person you’re looking for is not there, then keep typing and press enter. Once the search results come up, you will see a bar that says ‘pins’, ‘boards’, ‘pinners’. The content under ‘pins’ will show you only content that is specific to the words you typed. They will be images and you will be able to repin them to your own boards (see above). All the boards that match the keywords you put in will appear in this window. This is where you can find some pretty cool boards to follow. This is where you will find profiles. So, if you typed in my name “Hannah Teej”, you would find my profile under “pinners”, by clicking on my name you would be taken to a list of my boards, and therefore my pins. What’s the point in following people? And, how do I do it…? If you’ve followed the images above and managed to pin a few things then you’ll probably want to start thinking about following people. Following people means that when you log in, you’ll see more of what you want to see. Once you’ve logged in, Pinterest shows you a screen dedicated to all the people you follow and their recent pins. By following specific boards and people you will see images that are of more of an interest to you and discover more exciting web pages online. Search for people and content (see the above question), when you find things you like, look at the person who pinned it, look over their boards and, if you like what you see, follow individual boards. If you really like what you see when you’re navigating their profile, scroll to the top of their profile page and ‘follow all’. Simple as that. Now whenever that person pins to a board that you follow, you will see the image in your newsfeed. That’s that. I am all worded out about Pinterest. But if you need a simplified version of this information, comment below and I’ll answer you questions. I love seeing people on Pinterest, it’s one of my greatest sources of inspiration.